Following our recent posting here about the arrival in Devon of the new Class 800 Intercity Express Trains the Class 802's have now entered service in Cornwall. 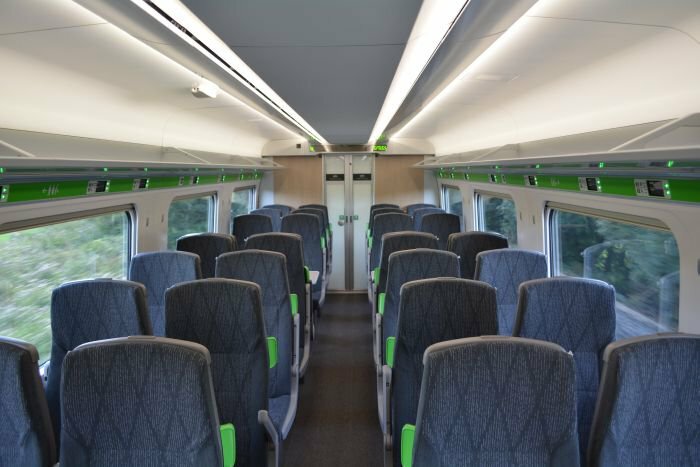 The Class 802 Intercity Express Train (802003 and 005) ran for the very first time on Monday 20th August with passengers on board, forming the 0553 Plymouth to London Paddington service. A second train (802 006 and 007) formed the 0730 London Paddington to Penzance service. “We know how important the railway is to the economies and communities of the South West and I am delighted to see this first new train for Devon and Cornwall services carry passengers. Last year, the first wave of Intercity Express Trains began running on the historic Great Western main line, connecting London to key UK cities including Reading, Swindon, Bath, Bristol and Cardiff. Production of these trains is continuing in the UK at Newton Aycliffe, County Durham. From today a second wave of 36 modern Intercity Express Trains began running between London Paddington, via Reading, Wiltshire, Somerset, along coastal routes in Devon and Cornwall and as far south as Penzance. The Intercity Express Train harnesses Hitachi’s pioneering bullet train technology, known for its quality and reliability. It has also been designed to withstand the region’s variable weather conditions, including routes along the Dawlish coast. Passengers can expect more seats, better on-board facilities and shorter journey times, saving as much as 14 minutes between London Paddington and Penzance once the new timetables are introduced in 2019. The entire fleet is fitted with hybrid technology, allowing trains to use both diesel and electric power, meaning passengers can enjoy the benefits of new trains as soon as possible. The new trains are seen as a boost for regional economies along the route, providing greater connectivity for businesses and tourist destinations. GWR has 22 five-car (802001-802022) and 14 nine-car sets on order (802101-802114). The 802's are based on Hitachi’s AT300 product platform and are similar to the class 800s already in operation with GWR on services from London to Bristol and South Wales. They will utilise higher engine operating power – 700 kW (940 hp) per engine as opposed to 560 kW (750 hp) on standard IEP's– and be fitted with larger fuel tanks to cope with the gradients and extended running in diesel mode expected on the long none electrified stretches they will operate on. The class 802 features a revised galley layout and a redesigned brake resistor mounting on the roof to ensure reliable operation on the coastal section of the Exeter - Plymouth line through Dawlish, where waves frequently wash over the line. The class 802 fleet comprises 22 five-car and 14 nine-car trains. Each five-car set will seat 290 passengers in standard class and 36 in first class, while the nine-car variant will seat 576 in standard class and 71 in first. There are two wheelchair spaces on the five-car train and four on the nine-car. Two five-car trains operating in multiple will offer 24% more seats than an eight-car HST. GWR says the introduction of the fleet will reduce the fastest Penzance - London journey times from 5h 19min to 5h 5min. Trans Pennine Express and Hull Trains also have class 802's on order.